Page 11 - KaBOOM! News | KaBOOM! NBC News today unveiled the first in a series designed to help parents get back to the basics. 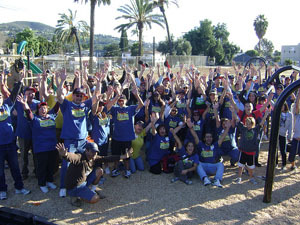 In this story about the importance of creative play, they talk to KaBOOM! Founder and CEO, Darell Hammond, about the power of the playground. “I will be using much of the KaBOOM! webinar information as I revisit my playground committees. As you are well aware, school systems are struggling with financing which has direct consequences on staffing. Some of my key playground committee members at Edison Park Elementary are in job placement limbo, we need to wait to see where the school district places them, as much as we want them back. Thanks to the webinar and website information, I can start structuring the roles/responsibilities of various committees and reorganize as necessary in the beginning of the school year. We had many teachers and parents volunteer at our last end of the year faculty gathering and plan to start up again immediately at our first PTA/PTSA meeting and opening of schools faculty meetings. 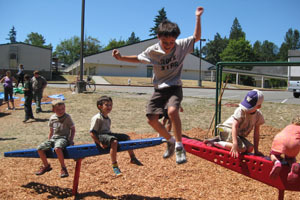 Play it forward with a donation to help Jackie and other hopeful playground builder dream’s alive. "In the beginning I was just a mom who didn’t want her kids to have to go to a school without a playground. Our current playground had been built 50 years ago, and did not meet current safety standards – it was due to be removed. 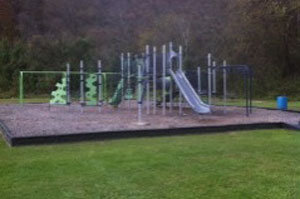 The district didn’t have the money to replace it, and if our local PTA couldn’t raise the funds, there would be no playground. What’s a mom of two boys to do? Volunteer to lead the playground committee, of course. I had no idea what I was getting into when I volunteered. I didn’t know about the costs of equipment, safety standards, special wood chips, or working with cities and school districts. All I knew is that we needed a new playground, and fast. I did my homework and we needed to raise $100,000 for our new playground. That’s a pretty big goal for a school with a 50% free and reduced school lunch rate. That’s when I found KaBOOM!. 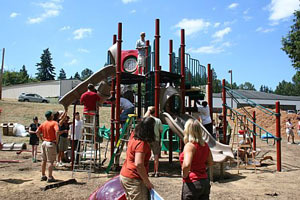 Their website took me step by step through the playground build process. I got great fund raising ideas, and fell in love with the community build model. We could save money and come together as a community. 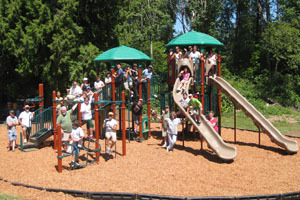 Within a year, we had the funding for the majority of our playground build. The community build was an experience I’ll never forget. We had school family members, community members, and even the Mayor at our build! 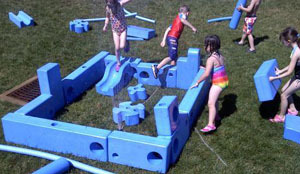 Thanks to the build, the city became more and more interested in the cause of play. We have been a Playful City USA for the past two years. 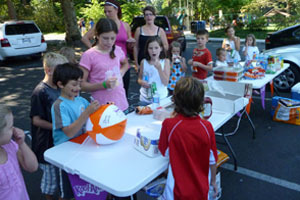 I help the city with the Playful City application each year, and am part of the play committee for the City of Kenmore. I’m excited that our city values the health and happiness of our youngest residents and understands the importance of play. The city is leading its first community build this spring. 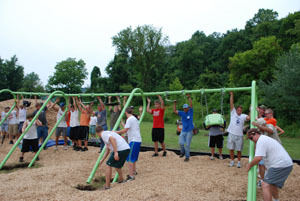 Now I help out other schools in the area when they start a playground project. I am passionate about helping in any way I can to ensure all kids have a safe playspace that they can walk to and enjoy with family and friends." Stacey saw a need in her community and she addressed it. Along the way she found the resources and tools she needed from KaBOOM!. 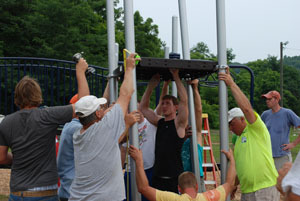 Play it forward so we can keep providing tools and resources to future playground committee chairs, and everyone else looking to make a difference. 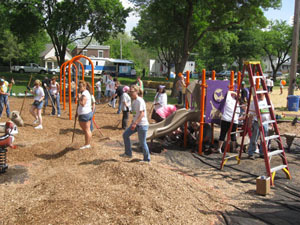 "We worked on a build in Rockford through the Rockford Park District and MetLife. We have also helped on builds at nearby sites. The change in a neighborhood - the ownership of all ages to build, use and protect their new playground is incredible to see! I loved every minute of being involved in our May 2010 build and have visited the site several times just to see the happy kids. Thanks to KaBOOM! 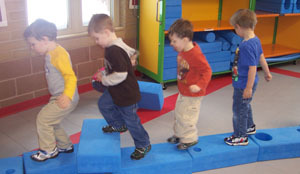 I am much better informed about the importance of play and have used the planning tools to help plan other events as well. Thanks much!" Play it forward with a donation if you agree with Dave & Judy that play is important!